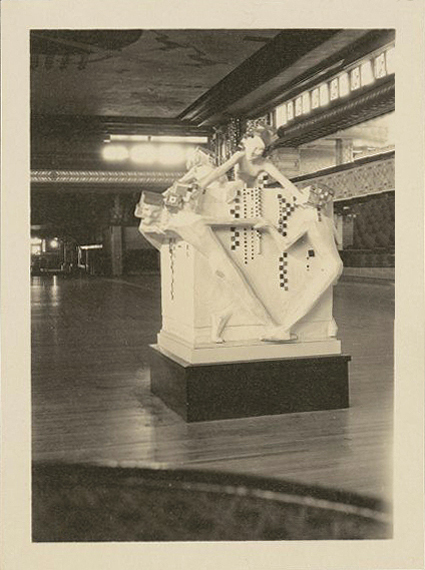 Images from the Eric Milton Nicholls collection, possibly by Burley and Griffin, Circa 1924-26. This is a very important set of images that document the changes to Midway Gardens. In October of 1923, the Winter Garden was revised and enlarged by removing balconies (Kruty P47, F44). The four large male and female sprites (Cube, Octagon, Triangle, Sphere) were moved out into the Summer gardens. The most important image in this set is the fountain (#11). 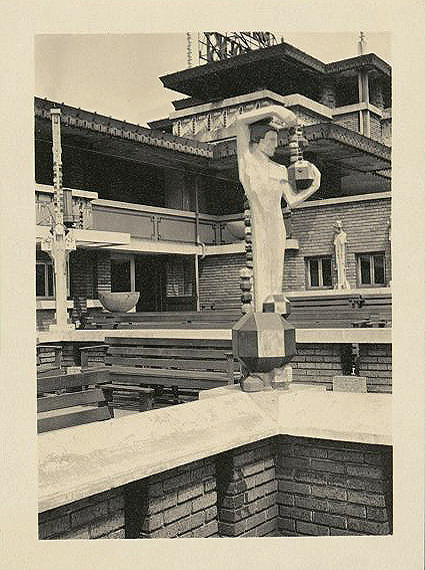 In Kruty’s “Frank Lloyd Wright and Midway Gardens”, page 136 he states that “Although no known photographs show the promenade’s interior and, thus, the site of either fountain, it is possible to get some idea of their forms from drawings and fragments.” This may be the only image of the fountain that exists. Courtesy National Library of Australia. ﻿1: Looking North at the South Belvedere. The South Entrance has been removed. Spheres have been added to the tops of the towers. 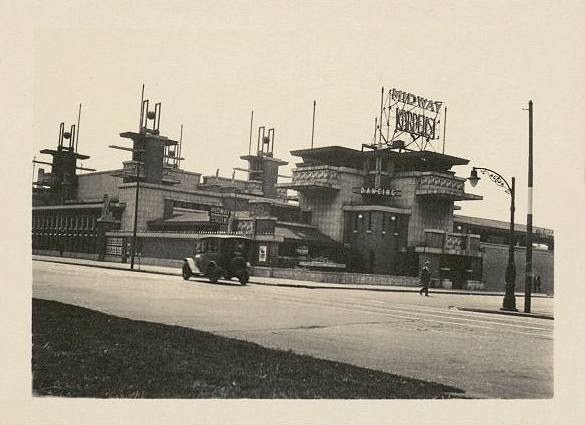 2: Looking Northwest toward the Northeast corner of Midway Gardens. 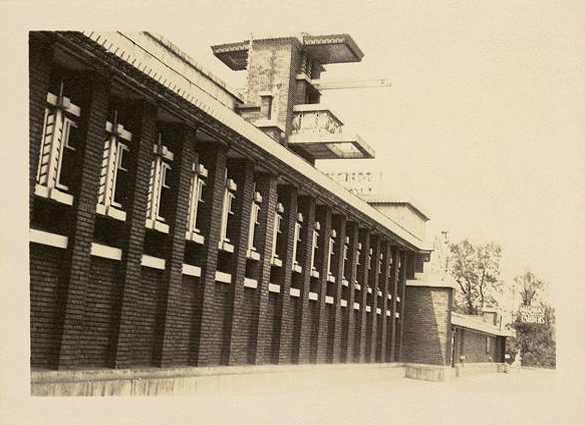 Winter Gardens is on the left, one of the towers seen above, the Cottage Grove Avenue Entrance to the right. 3: Looking Northwest toward the North Belvedere. The Tavern is in the foreground. Large sign has been added to the top of the Belvedere. 4: Queen of the Gardens Sculpture sits atop a brick column, which is situated just to the right of the Winter Gardens. To the right, a door has been added to the Service Entrance. 5: Looking Southwest to the corner of Cottage Grove Avenue and Sixtieth. The Winter Garden is on the left, North Belvedere in the center and the North Arcade on the right. Spheres have been added to the tops of the towers, as well as large signs. Large Robie House styled vase can be seen on the corner. Two also appeared on either side of the Stage. The are different then the ones that appeared in the Summer Garden. 6: North Arcade, looking West from the East end of the Arcade. 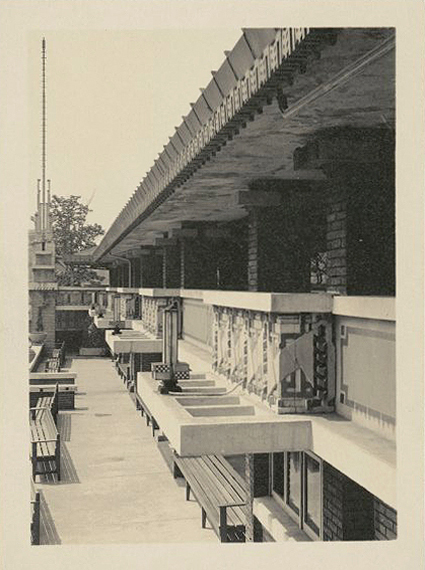 Four cantilevered trellised overhangs are visible, lamps have been placed on them. Benches have replaced tables. 7: Looking Northeast from the Summer Garden, the North Arcade is on the left, the North Belvedere is to the right. This male Sprite holding octagon was originally placed in the Northeast corner of the Winter Garden. I believe this is the Northeast corner of the interior terrace wall. Like the balconies in the background and many other Sprites, this one was also painted. 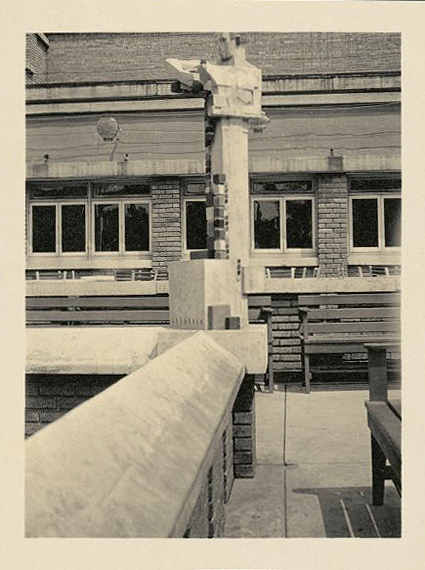 8: Male Sprite holding cubes was originally placed in the Southwest corner of the Winter Garden. I believe this is the Southeast corner of the interior terrace wall. Like the balconies and many other Sprites, this one was also painted. 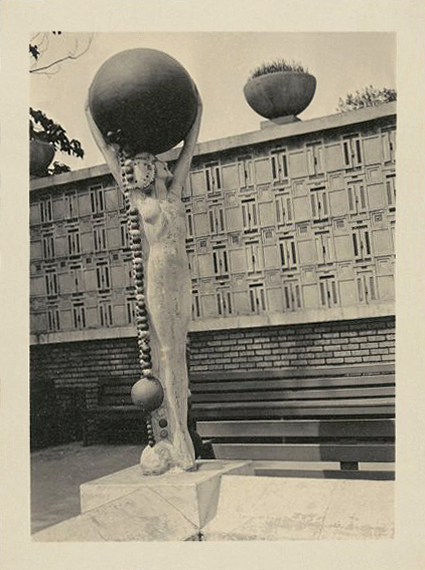 9: Female Sprite holding sphere was originally placed in the Southeast corner of the Winter Garden. This is the West end of the interior terrace wall. Like many other Sprites, this one was also painted. 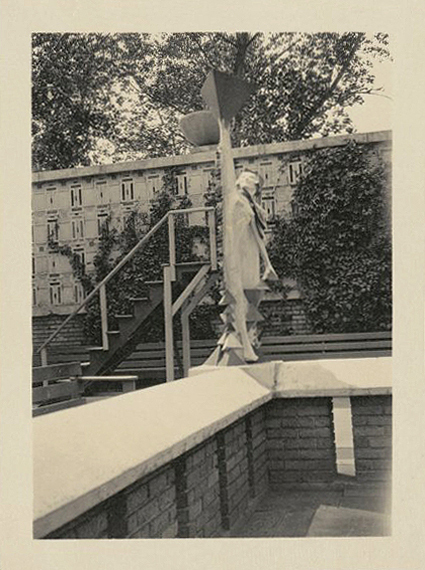 10: Female Sprite holding triangle was originally placed in the Northwest corner of the Winter Garden. This is the West end of the interior terrace wall. Like many other Sprites, this one was also painted. 11: This may be the most important image in this set. 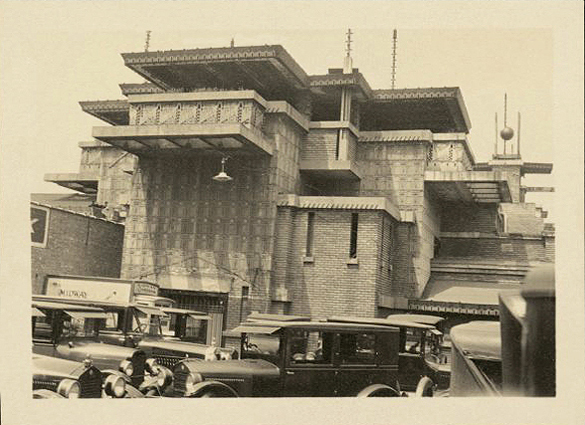 In Kruty’s “Frank Lloyd Wright and Midway Gardens”, page 136 he states that “Although no known photographs show the promenade’s interior and, thus, the site of either fountain, it is possible to get some idea of their forms from drawings and fragments.” This may be the only image of the fountain that exists. 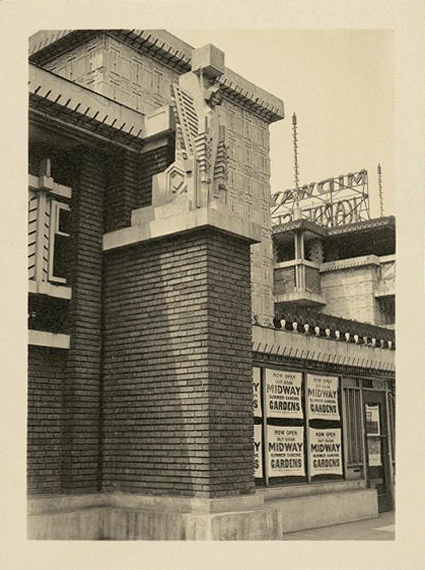 Series of 11 images of architect, Frank Lloyd Wright's Midway Gardens, Chicago. Photograph probably taken by Walter Burley and Marion Mahony Griffin. 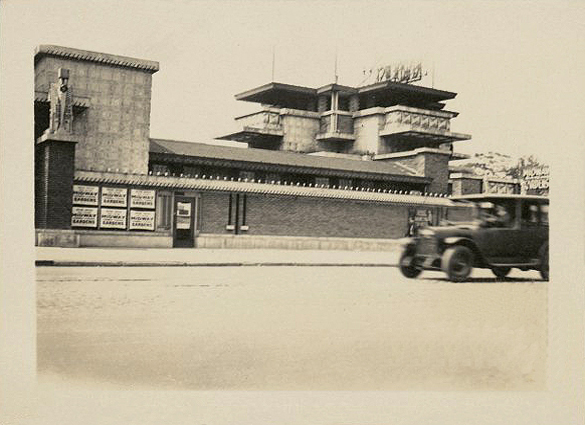 Photographs taken between 1924-26.